There’s a hint baked into the new Huawei Watch listings on Amazon about Android Wear compatibility with the iPhone. Android Wear may be very close to working with iOS. That’s the report from Android Police, citing multiple anonymous sources and a hint in a retracted Amazon listing for the Huawei Watch. Android Police tends to have a pretty good track record with such rumors, which are consistent with what we’ve heard before about Google working on iOS compatibility for Android Wear. Initially the Huawei Watch listing on Amazon said it was compatible with iOS 8.2 or greater. The listing has been taken down, but the fact it made it into the Amazon listing at all indicates someone may have jumped the gun in posting that detail. The gold models are almost certainly gold plated, as a watch that’s completely gold usually costs $10,000 or more. 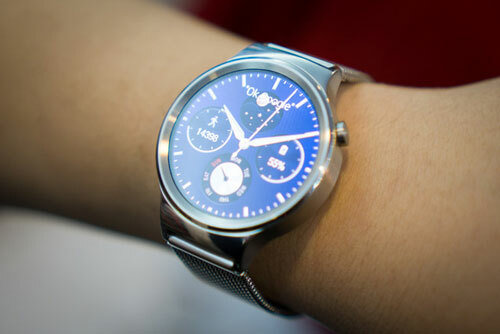 Nonetheless, Huawei is clearly casting a wide net, with an entry-level option that’s comparable to other smartwatches and a couple of models who want something more luxurious to wear. The story behind the story: When we first saw the Huawei Watch, we were rather impressed. It has the type of build quality that might make someone who wants a great-looking timepiece think about a smartwatch for the first time. However, a lot of those who are willing to spend $800 or more on a smartwatch are iPhone owners, so it’s not surprising that the launch of Android Wear for iOS is near. It’s something to look out for as the Berlin IFA conference nears.